Giselle Makhan: Happy 50th Anniversary, Flintstones! The Flintstones celebrate their 50th anniversary! 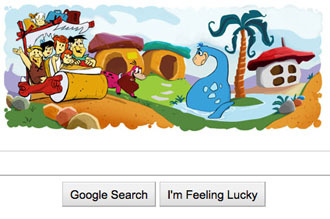 Google celebrates this special milestones with a Google Doodle. Google Doodle is when Google changes the image on their homepage to celebrate an event. 1. The Flintstones is set in the Stone Age and follows the lives of a working class family. 2. The first cartoon was broadcast on American TV in 1960 and the last six years later. 3. There were 166 episodes. 4. Each was set in the Stone Age town of Bedrock, also called Rockville in early episodes. 5. The theme tune was one of the most recognised kids TV theme tunes among British adults, according to one survey. 6. There are several Flintstones theme parks in the US. 7. Fred Flintstone, the main character, is an accident prone quarry worker. 8. Fred's voice was provided by Alan Reed and Jackie Gleason. Mel Blanc was responsible for Barney's. 9. The show was originally going to be called The Flagstones. 10. The theme tune was created by Hoyt Curtin. I <3 the Flinstones! And the Google Doodles. :-) Did you see the Pac Man one not long ago where you could actually PLAY??? Too great.